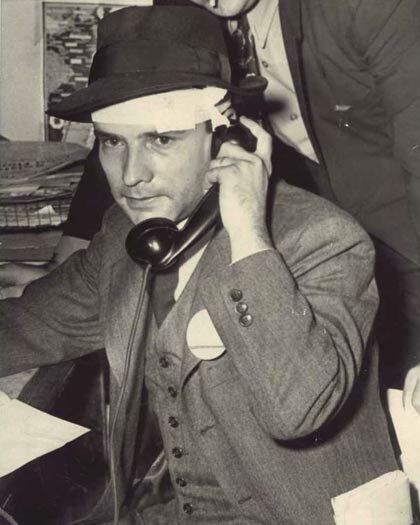 Jimmy Wechsler in his heyday at the New York Post, 1948. He was above all a newspaperman, combative, sentimental, inflamed by the battles of his time, his pen a weapon of truth and human commitment. The old lion, the little warrior, Jimmy Wechsler, is gone now. I see him still, sitting at his desk in his shirt sleeves and bow-tie, his tousled hair spilled upon his forehead, boyish, intense, writing at a furious pace, the Met game blaring, the bottle of bourbon at hand, ashtray overflowing. He was a fierce adversary, an iconoclast doing battle with a paradoxical world, a sense of the human comedy through it all. Always there was laughter, whimsy, hilarity, the ironic aside, a sense of the comic absurd. There was no pretension to Jimmy Wechsler. His office was a scene out of The Front Page, cluttered with photographs, books, memorabilia. And the political machinators came and went — Nelson Rockefeller, Hubert Humphrey, Robert Kennedy, John Lindsay, Hugh Carey, Mario Cuomo. The procession was unending; the greats and the near greats paid their call. It was a time of excitement, heated editorial conferences with the publisher, Dorothy Schiff, Al Lowenstein dropping by for a hamburger and milkshake, David Dubinsky on the line, Alex Rose, Arthur Schlesinger Jr., Joe Rauh, Robert Morgenthau, Jimmy’s secretary, Carole Dozier in a whirlwind of action. Inside the suite of offices, Joseph Lash pounded out the day’s editorials. Vietnam was in flames but when it came to Lyndon Johnson’s proclamation or the World Series, it was a tortuous decision for the editorial page editor. Incessantly, he would flip the television dial back and forth to the baseball game during the President’s drawling lulls. I remember Jimmy writing at lightning speed at his desk when the movers arrived to slowly take every piece of furniture, every chair, book and document from Jimmy’s fourth floor suite of offices at 75 West Street, leaving only Jimmy, holding his pencil and paper in his lap and listening to the Met game. The rest of us had moved to 210 South. He ran the New York Post when it was still an organ of journalism. He became its editor in chief in 1947 and transformed it into a vehicle of journalistic force with soaring readership. Investigation, sparkling political commentary, human portraiture — these were its hallmarks. Its news coverage was political, its heart compassionate. It was a progressive liberal tabloid. “So-called bleeding heart journalism was what made the Post. That’s what the Post was all about,” recalled ace investigative reporter Joe Kahn. Joe recalled an early morning confrontation by Jimmy. “How about living at the Municipal Lodging House for Men and finding out what’s going on there?” demanded Wechsler. “Are you growing complacent?” responded Wechsler. “I’ll be there tonight,” stated Joe. Jimmy’s editorials were “like pillars of fire”, his old friend Joe Lash was to recall. “His speed in composition was unnerving,” the legendary Abe Raskin would remember. “He could turn out an editorial column in half an hour. It took an editorial board of six men at the New York Times working all day to accomplish the same thing,” he laughed. At a crucial time in our history, Jimmy Wechsler did not fear to raise his journalistic voice. He took on Joe McCarthy when no one dared to challenge. His was a voice of courage in a season of hysteria. His targets were the untouchables — McCarthy, J. Edgar Hoover, Walter Winchell, the icons of the day. He was a pugilist and he was a poet. He wrote with fiery eloquence in a rage for justice. His credo was to comfort the afflicted and afflict the comfortable. He fought for labor and he fought for civil rights, he fought for equality and brotherhood of spirit. He answered the call of conscience. He was above all a battler for the underdog, a champion of difficult sad causes. He was an incorrigible romantic, almost childlike in his beliefs. He helped countless little people, fought for the little man. He sought a more visionary world in which nuclear madness and human violence did not prevail — this shy lad, this funny lad, this quiet observer of man’s folly. There were so many he loved — Adlai, Norman Thomas, Al Lowenstein, John and Robert Kennedy, FDR and Eleanor. They are all marching with him, Martin Luther King, Al, Jimmy, the gallant men of his age who cried out against intolerable sadnesses, brutalities of life. He lived in a state of quiet revolution, this gentle man, Jimmy Wechsler, his pen a weapon as mighty as the sword.